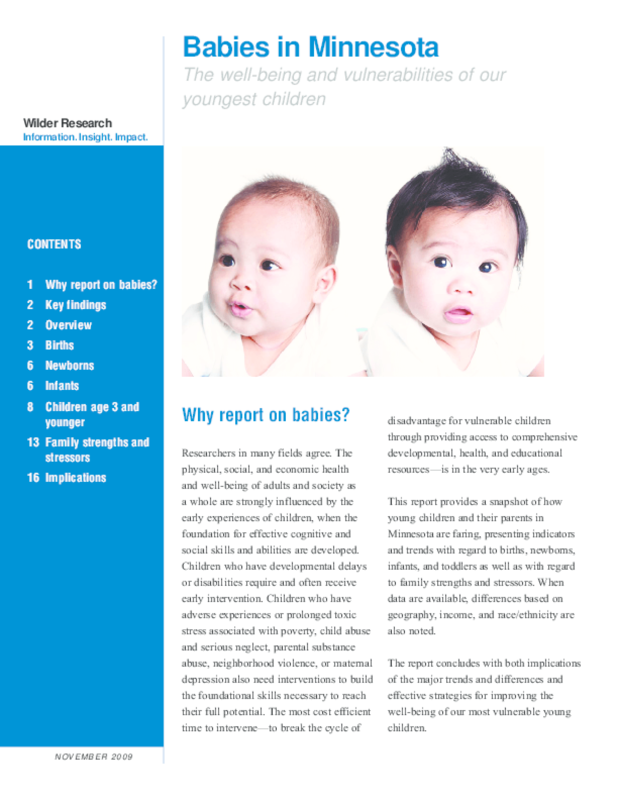 Summarizes how young children and their parents in Minnesota are faring, including indicators and trends with regard to births, newborns, infants, and toddlers as well as family strengths and stressors. When data are available, differences based on geography, income, and race/ethnicity are also noted. The report concludes with both implications of the major trends and differences and effective strategies for improving the well-being of our most vulnerable young children. Wilder Research reports are made available on our Website to improve the community's understanding of major social issues. Permission to download and copy reports is granted for private, non-commercial and education purposes only. All reproductions require an acknowledgment of the source and author of the work. No resale use may be made of any report without written permission.